Editor's note: FireRescue1 is supporting the inaugural National Firefighter Health Week with a range of articles and resources over the next five days. Organized by the NVFC, the initiative focuses on a different health issue relevant to all firefighters every day this week. It began Monday with behavioral health — the responsibilities of fighting fires and responding to emergencies are stressful both physically and mentally. In this first article for Health Week, a medical team from New York discusses their experiences with the FDNY. 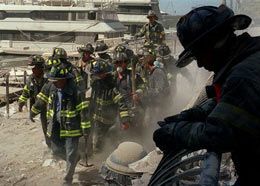 They began their work in the aftermath of 9/11, but their advice is applicable to firefighters — career and volunteer — across the country who are regularly exposed to traumatic incidents. Firefighters carry an injured brother from the World Trade Center area on 9/11. Our research found that, in addition to exposures related to 9/11, participants experienced an average of four or five prior potentially traumatic stressors. It is not uncommon for post-traumatic stress disorder to develop after multiple traumatic events. A natural result of trauma and crisis is that past – and even deep-seated – memories or associations of previous threats or losses may be stirred up. We are well aware of the stigma that endures around getting mental health care, but have been encouraged by firefighters' increasing openness to mental health services. However, we have found that the authorities under which firefighters are employed tend to be the most difficult barriers to reaching those in need. One of the main difficulties we faced was the fact firefighters are not at the same worksite and are spread out into communities across the city; it was difficult to outreach to them. We learned that finding a common ground — such as through public education and at stress reduction workshops — was valuable in introducing our services while taking into consideration firefighters' roles and responsibilities. Another concern of many firefighters related to seeking mental health services is the potential effect on their duty status. This causes some firefighters with serious symptoms to put off seeking help, which obviously can create problems form them further down the line. Eventually, their symptoms are likely to impair their ability to work, which can lead to them being placed on medical leave or light duties. If they had sought help earlier, this could have been avoided. Receiving mental health services does not mean that a firefighter is unfit for full duty, but it's vital that firefighters seek help as soon as symptoms begin to surface. Many firefighters that we worked with have experienced complete resolution of symptoms and have returned to their previous healthy mental state. However, some are still struggling with the after-effects of their 9/11 experiences and have post-traumatic symptoms that require psychotherapy, psychiatry and/or medication. These after-effects can apply to any traumatic incident suffered on duty. Recent studies on PTSD report the persistence of post-traumatic symptoms and high rates of related co-morbid disorders in many victims who develop PTSD in the aftermath of the trauma. Some World War II veterans, for example, have remained symptomatic 40–50 years after the end of hostilities and up into old age. But in some cases, symptoms of PTSD may not emerge until years after the trauma. Also, upon hearing of pulmonary and other life-threatening diagnoses, symptoms can later emerge or reappear. Some firefighters develop unhealthy coping methods to deal with their overwhelming memories and feelings. Many of those we worked with after 9/11 developed secondary problems resulting from the trauma. One way of coping is turning to alcohol or other substances and behaviors such as gambling to try to manage their feelings. These destructive behaviors, which often mask underlying symptoms of depression and anxiety, can be treated with psychotherapy, medications and with the help of programs like AA. Unrecognized and unacknowledged emotional trauma can create lasting difficulties in an individual's life. One way to determine whether an emotional or psychological trauma has occurred is to look at the kinds of recurring problems one might be experiencing. Sometimes, issues can just arise or be noticed. In many cases, people wait, thinking that the problems would go away. If you feel that any of these previously listed symptoms are affecting your life and/or your family members' lives, it is important to seek help as soon as possible. For a consultation about your or family member's issues, contact an Employee Assistance Program, union resource or community mental health clinician.